A cheeky calzone (folded pizza) is your bonus, fuss-free meal for going to the effort of making your own pizza dough. Get stuck into pizza-making as a family at the weekend, make double quantities of the dough and freeze half, sectioned off into four balls of dough in individual freezer bags. That way you can take one or two bags out on a rushed midweek morning of the day when you want to cook them, leave in the fridge while you go about your 9-5, then come home and knock up a tasty pizza pocket with the kids in next-to-no-time. When it comes to the contents of a calzone, anything goes. Do you have the end of a block of cheddar, maybe a few scraps of ham and some mushrooms? Or perhaps a little salami, half a pepper and some mozzarella? A can of tuna, a few tomatoes and nibble of Parmesan? A bit of broccoli you can steam then mash up with lemon juice and cheddar? In any of these cases a few fresh basil leaves plus salt and pepper will result in a thoroughly lovely meal. But if you happen to have a little leftover sausage ragu to hand in the freezer, now's the moment to defrost it alongside your pizza dough and have a real winner on your hands. One of your quarters of pizza dough makes one calzone which will feed two little kids or one adult. 1. Preheat the oven to 220°C/425 °F/Gas mark 7. Get the kids to roll out the pizza dough into a circle on a lightly floured surface. Add the ragu (or other filling) to one half of the dough and flatten a little with the back of a spoon. Get your kids to grate a good handful of cheddar over the top, or rip up the mozzarella and scatter it over. Tear over a few basil leaves and season with salt and pepper. 2. 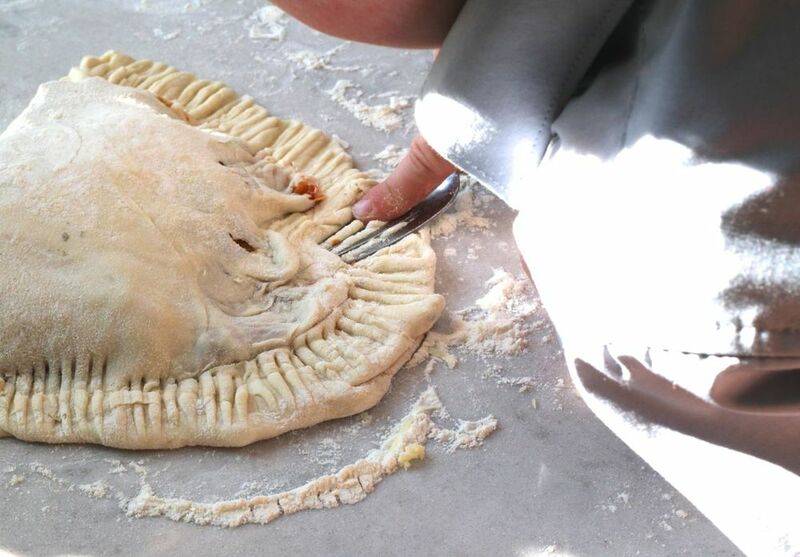 Carefully fold the other half of the dough to give a semi-circle and press down the edges of the pastry with your fingers to seal. Kids like taking a fork and pressing the prongs down to make a little fluted edging. It doesn't matter if it looks a bit rustic. Lift it carefully onto a lightly oiled baking sheet and cook for 30 minutes until golden brown.